Rob Lafrenie is an Affiliate Scientist at the Health Sciences North Research Institute and has cross-appointments at the Northern Ontario School of Medicine and Laurentian University. He teaches at both the undergraduate and graduate levels. Rob received a B.Sc. in Biochemistry from the University of British Columbia and a M.Sc. and Ph.D. in Medical Sciences from McMaster University. 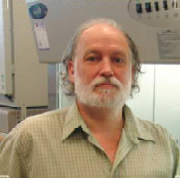 He then did a postdoctoral fellowship at the National Institutes of Health in Bethesda, Maryland. Rob joined the Cancer Care Ontario Research Group at the Northeastern Ontario Regional Cancer Centre in 1997 and transferred to the Sudbury Regional Hospital and Northern Ontario School of Medicine in 2005. We have been investigating a large number of potential therapeutics for anti-cancer activity in vitro and in mouse models. We have made the most progress in testing the efficacy of exposure to a specific electromagnetic field as an anti-cancer treatment. This project was developed in collaboration with Dr Michael Persinger. We have shown that daily exposure to this specific, complex EMF can inhibit cancer cell growth in vitro and in a mouse model. The mechanism underlying this effect involves EMF-dependent alterations in calcium influx, via voltage-gated T channels, which alters cell signaling pathways, cyclin expression, and cell growth. In vivo, exposure to the EMF also seems to promote leukocyte influx into the tumour. Studies are in place to more completely understand the mechanistic basis of this affect, examine the possibility of synergism with other agents, and develop a clinically testable apparatus. In addition, we are evaluating several plant extracts for anti-cancer activities. We have shown that treatment of cultured cancer cells with flaxseed oil promotes cellular apoptosis while treatment of non-malignant cultured cells has no significant effect. We have been characterizing the fatty acid components of flaxseed oil which appear to be critical for this effect. We have also shown that the South American traditional plant, Uncaria tomentosa (Cat’s claw), can inhibit inflammatory responses in monocytes and can promote apoptosis in some cancer cells. This appears related to the inhibition of the NF-kB transcription factor (subunit p50) in response to treatment with Uncaria extracts. Treatment with Uncaria tomentosa extracts can also inhibit cancer growth in a mouse model. We have also shown that a wide range of natural products or traditional medicines can inhibit cell growth or promote apoptosis in cancer cells. For example, studies looking at Nigella sativa, honey, Andrographis, Zingiber, Chaga mushroom, and Princes pine are in progress. Continuing work on these projects involves fractionation of the extract to identify active agents (or active combinations) and in determining the mechanistic targets of these agents. I have been studying the effects of integrin-dependent cell adhesion on cell signaling pathways in a variety of cell models since my graduate and postdoctoral studies. We have shown that cell adhesion to fibronectin-coated substrates activates a wide range of signaling molecules including PKC, PI 3-kinase, and ERK kinase pathways. We have also shown that cell differentiation can be induced by cell adhesion in a process dependent on changes in gene expression and the activation of PKC and MAP kinase signaling pathways. Continuing work on this project is set to examine the effect of cell adhesion on drug resistance in cancer cells, and on the promotion of pro-inflammatory effectors in immune cells. Further, there appears to be significant “cross-talk” among these signaling pathways which is required to promote changes in cell behaviour in response to cell adhesion. Over the last several years we have been attempting to identify genetic or protein biomarkers that can predict outcome for patients with breast cancer being treated with standard chemotherapies. For example, we have shown that there is an association between single nucleotide polymorphisms in DNA repair and cellular detoxification enzymes and clinical outcome for some patients with breast cancer. We have also shown that immune system markers such as cytokines and immune cell types (imunophenotype) can be associated with responses to therapies. The goal of these studies is to develop a group of prognostic biomarkers that can be used by clinicians to assist choosing the best therapy option. Buckner CA, Lafrenie RM, Denommee JA, Caswell JM, Want DA. Complementary and alternative medicine use in patients before and after cancer diagnosis. Current Oncology 25:e275-e281, 2018. Buckner CA, Buckner AL, Koren SA, Persinger MA, Lafrenie RM. Exposure to a specific time-varying electromagnetic field inhibits cell proliferation via cAMP and ERK signaling in cancer cells: EMF inhibits cancer cell proliferation. Bioelectromagnetics 39:217-230, 2018. Allen L, Buckner A, Buckner CA, Cano P, Lafrenie RM. Uncaria tomentosa (Willd. Ex Schult.) DC (Rubiaceae) sensitizes THP-1 cells to radiation-induced cell death. Pharmacognosy Research 9:221, 2017. Santi, SA, Meigs ML, Zhao Y, Bewick MA, Lafrenie RM, Conlon MS. A case-control study of breast cancer risk in nurses from Northeastern Ontario, Canada. Cancer Causes and Control 10:1421-1428, 2015. Buckner CA, Buckner AL, Koren SA, Persinger MA, Lafrenie RM. Inhibition of cancer cell growth by exposure to a specific time-varying electromagnetic field involved T-type calcium channels. PLOS One 10(4):e0124136, 2015. Young, SD, Lafrenie RM, Clemons, MJ. Phase II trial of a metronomic schedule of Docetaxel and Capecitabine with concurrent Celecoxib in patients with prior Anthracycline exposure for metastatic breast cancer. Current Oncology 19:e75-e83, 2012. Hu JH, St-Pierre LS, Buckner CA, Lafrenie RM, Persinger, MA. Suppression of growth of injected melanoma cells by whole body exposure to specific spatial-temporal configurations of weak intensity magnetic fields. International Journal of Radiation Biology 86:79-88, 2010. Allen-Hall L, Arnason JT, Cano P, Lafrenie RM. Uncaria tomentosa acts as a potent TNF-alpha inhibitor through NF-kB. Journal of Ethnopharmacology 127:685-693, 2010. Allen-Hall L, Cano P, Arnason JT, Rojas R, Lock de Ugaz O, Lafrenie RM. Treatment of THP-1 cells with Uncaria tomentosa extracts differentially regulates the expression of IL-1alpha and TNF-beta. Journal of Ethnopharmacology 109:312-317, 2007. Bewick MA, Conlon MSC, Lafrenie RM. Polymorphisms in XRCC1, XRCC3, and CCND1 and survival after treatment for metastatic breast cancer. Journal of Clinical Oncology 24: 5645-5651, 2006. Lam K, Zhang L, Bewick M, Lafrenie RM. HSG cells differentiated by culture on extracellular matrix involves induction of S-adenosylmethionine decarboxylase and ornithine decarboxylase. Journal of Cell Physiology 203:353-361, 2005. Zhang L, Bewick M, Lafrenie RM. Role of Raf-1 and FAK in cell density-dependent regulation of integrin-dependent activation of MAP kinase. Carcinogenesis 23:1251-1258, 2002.